The Federal Communications Commission acknowledged Wednesday that bots were not responsible for the agency's website slowdown after it sought public comment last year on its controversial plan to repeal net neutrality. 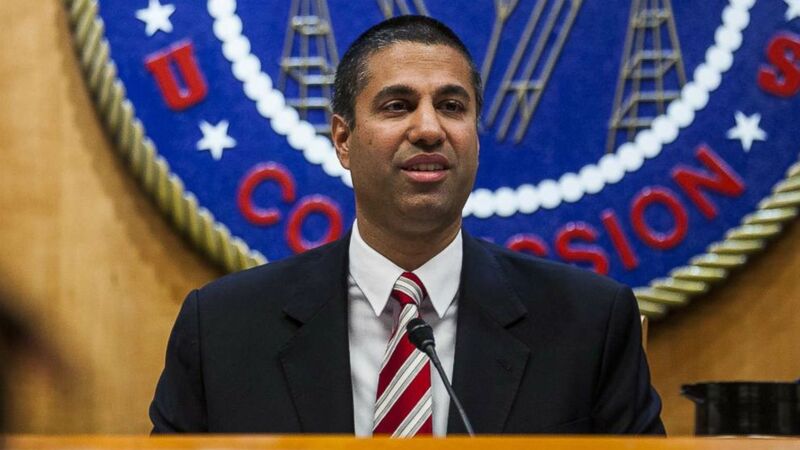 After people were temporarily unable to contest the proposal, the FCC at the time put out a statement blaming the issue on an "attack" by bots coordinated by "external actors." (Zach Gibson/Bloomberg via Getty Images) Ajit Pai, chairman of the Federal Communications Commission (FCC), speaks during an open meeting in Washington, D.C., Nov. 16, 2017. "Beginning on Sunday night at midnight, our analysis reveals that the FCC was subject to multiple distributed denial-of-service attacks (DDos)," said Chief Information Officer David Bray in the statement. "These actors were not attempting to file comments themselves; rather they made it difficult for legitimate commenters to access and file with the FCC." However, the slowdown was likely due to a boost in use, the inspector general found. "The degradation of ECFS system availability was likely the result of a combination of: (1) “flash crowd” activity resulting from the Last Week Tonight with John Oliver episode that aired on May 7, 2017 through the links provided by that program for filing comments in the proceeding; and (2) high volume traffic resulting from system design issues," an inspector general report says. Traffic had increased by 3,116 percent, according to the report, but that was likely caused by a segment on "Last Week Tonight with John Oliver" and the host's call to action to flood the agency's public comment page with protests. The inspector general said it "learned very quickly that there was no analysis supporting the conclusion" of the FCC's allegation of an attack and "there were no subsequent analyses performed, and logs and other material were not readily available." ABC News' attempts to reach Bray were unsuccessful. He left the agency in October 2017. Before the report was publicly released, FCC Chairman Ajit Pai blamed the misinformation on his former Chief Information Officer, who was hired by the Obama Administration, for the inaccurate initial statement. "I am deeply disappointed that the FCC’s former Chief Information Officer (CIO), who was hired by the prior Administration and is no longer with the Commission, provided inaccurate information about this incident to me, my office, Congress, and the American people," Pai said in a statement.